Non Peugeot Cars and Bikes. News and discussion. I'm not that great at reviews, so hopefully this isn't too boring lol. This car comes quite well equipped as standard, but misses a lot of things that some cars come with as standard. The BMW does not support speed camera locations, and Speed Limit information is an optional extra. When we went in to order the car, I managed to get a 16% discount through car wow, plus they were offering £4,500 deposit contribution. So, all in all, I got a 99% full spec car for the price of a base spec version. Below is the spec I went for. 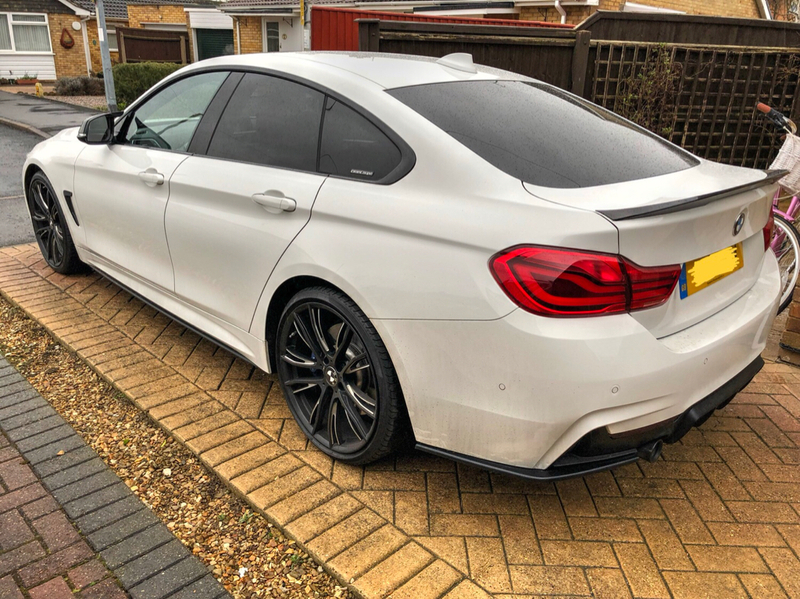 I took the car on a rolling road, and although it only had 800 miles on the clock, it was producing 337bhp, which is 15bhp over the quoted figure. Once the engine loosens up a bit, it should produce even more than that. As for fuel, this engine is both really thirsty, and economical lol. Under spirited driving, it can average anything between 8-17 mpg. Under normal town driving, it will return about 22-23mpg and on the motorway it returns 38-40 mpg. My overall average is about 25ish. Overall, this is a great car! It is the first high performance of the B series engines. Feel free to look up the B58 for some light reading. My plans for the future involve getting the M Performance kit for it, so that the looks match the grunt, and also a power and sound kit, so it also has the sound lol. I also have a few videos on youtube. Is that a camera I see beside the near side front wheelarch? Whats the harmon kardon sound system like? any ideas why the bhp figure is higher than specified? whats a power and sound kit?? I have to say its a gorgeous looking machine. Best of luck with it. shame about the car park dent. these things happen I suppose. Haha. Thanks, I'll answer as best I can. Yes, there is a camera and a parking sensor in front of the whee arch. These are part of the surround view and parking assist. The camera is mainly used so you can see round corners when you poke your nose out of a junction or parking space. The sensor is used to measure potential parking space sizes for one that the car will fit into. It will then notify me when it finds one, and it can then proceed to do the steering for me when parking in that space. The system has 16 speakers, so has really good surround sound for all passengers. Two of these speakers are subwoofers under the seat. They arent as punchy as a 10" in the boot, but for normal everyday listening, they are brilliant. The range is so much better than that of my RCZ. BMWs are often known for understating their power outputs. This engine is their new high end engine that will also be in the new Toyota Supra. I think with my particular car, it may be that I have only ever run it on 99RON petrol and have installed a K&N Panel filter. Both in themselves probably doesnt give a lot extra, but together seems to be doing the trick. The Power and Sound kit is a dealer fit option that swaps the 2.5" exhaust system with a 3.0" system to give a much louder burble, and a couple of my friends have even managed to get the exhaust to pop when downshifting. With this, the dealer also remaps the engine to take it from 326bhp to 355 bhp. But some people have had the dyno show 380bhp. happy new car Abz what a bummer you had some Tw*T slamed their door into your new pride and joy I just can’t believe some folk! That was not just a little tap! Hopefully you’ll have more luck from now on. Congrats mate. Bugger about the damage so early on! so how near to the 41mpg figure have you been getting????? A buddy of mine has the old 335i, E92. The true biturbo 6pot engine by BMW. The RCZ R goes head2head up to about 140 MPH and then the beemer starts to pull slowly away. But nothing extraordinary. More like the typical motorway scenario of two lorries racing each other. But the new version of this engine, the one you got under the bonnet, pumped up to indicated 320ish bhp and pushing north of 330bhp, is another piece of cake. No chance for me to keep up above 140 MPH. My friend had the F30 335i (think it had the same engine as the E92?) and he didnt believe me that the 0-60 time of the RCZ-R was nearly identical. The car I have has about half a second less 0-60 time to that, so like you say, probably more difficult to keep up. All I've got to say is this engine is amazing. It has great mpg for the power, and a decent power band. Im taking it on the Strip in July so will see how good it is there lol. But I'd love to push this motor day by day over the autobahns. I'd remove the limiter to enjoy speeds above 155. It is indeed a very comfortable car to use on daily basis, both the chassis and the drivetrain. I wish my RCZ sounded like this back in the day haha. Nice! Do you have any clips?